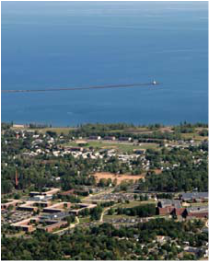 NTH is currently working with Northern Michigan University (NMU) regarding installation of a new 185 MMbtu combined heat and power (CHP) institutional boiler to provide steam and additional generating capacity. The circulating fluidized bed (CFB) boiler will be capable of firing multiple fuels including: coal, wood, and natural gas. The proposed project is subject to several federal regulations, including the Prevention of Significant Deterioration (PSD), National Emissions Standards for Hazardous Air Pollutants (NESHAP), and Standards of Performance for New Stationary Sources (NSPS) regulations. As a result of installing the new boiler, the facility will become a major PSD source subject to the Industrial, Commercial, and Institutional Boiler NESHAP, as well as, the NSPS for Industrial-Commercial-Institutional Steam Generating Units. As such, NTH will prepare a project description, discussion of the major project equipment, operating scenarios, fuel types, proposed emission controls, process description and flow diagram, proposed emission rates, and exhaust stack parameters. contemporaneous period is greater than the major source thresholds, this project is also subject to the Prevention of Significant Deterioration (PSD) regulations. Because the facility is within 100 km of a Class I area (Seney National Wildlife Refuge), an analysis of impacts on visibility will be done using the long-range model CALPUFF. Finally, the Michigan Department of Environmental Quality (MDEQ) has requested the performance of cooling tower modeling to address the impacts of icing and fog. NTH will use the Seasonal/Annual Cooling Tower Impact (SACTI) model developed for EPRI. After the final permit application has been submitted to the permitting authority, NTH will assist NMU in addressing any issues that may arise during the review of the application by the permitting authority. NTH is prepared to submit any additional information that may be required to complete the permit review. As necessary, NTH will participate in engineering meetings and discussions with NMU for final design, and agency meetings to discuss additional data requests or draft permit conditions. NTH will also assist NMU in the negotiation of permit terms and conditions. Post submittal support includes attendance at a public meeting in Marquette and assisting the MDEQ-AQD with responding to comments received during the public participation process.